You can’t have a discussion about the craft beer scene in the Philadelphia area without mentioning Tired Hands. The brewery has been around for years, but the recent New England IPA haze craze has helped the outfit gain prominence among craft drinkers on the East Coast, and the buzz is spreading around the country. Tired Hands also makes darker styles and Saisons, but weekly can releases typically feature fresh Pale Ales, IPAs and Double IPAs with other options folded in on a regular basis. 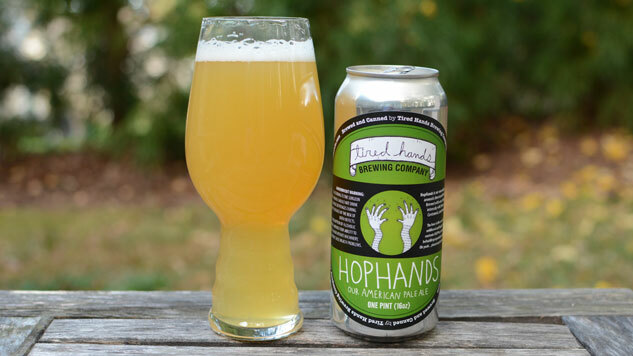 Hop Hands, Tired Hands’ American Pale Ale, pours a hazy golden orange hue, not unlike a glass of fruit juice. The haziness comes from the addition of oats during the brewing process, a common ingredient for the so-called New England-style beers. There’s also a decently thick pure white head that fades mostly to the edge of the glass where it immediately begins to leave lacing around the outside. In the nose, a punch of hop aromas are driven by “intense” additions of Simcoe, Centennial and Amarillo. The smell is mostly the earthy, grassy nature of the ingredient, but there’s also a hint of pineapple, grapefruit and other citrus varieties. The first sip follows the nose pretty well, although there’s more of that pineapple/grapefruit quality in the taste than there is in the nose. I’ve tried a few New England IPAs and Pale Ales, but it never ceases to amaze me how breweries are able to get so much hop flavor into their beers without the bitterness that’s normally a trademark of those styles. The debate rages on about the hazy beers, but in my opinion, they give beer drinkers an opportunity to really taste what certain hop varieties have to offer. Hop Hands is a very flavorful Pale Ale, but it doesn’t overwhelm the palate. Most of what you taste here are the flavors the hops impart into the beer rather than any bittering. To me, this method for brewing an IPA or Pale Ale makes the styles more approachable for people who may not be “hop heads.” However, there’s plenty here in Hop Hands for folks who are big fans of hoppy beers, too. And at 5.5%, this is one flavorful, and quite crushable, lower ABV brew. If you find yourself in the Philadelphia area early in the week, you might have a shot at picking up some cans. That’s currently the only way to get your hands on 4-packs of Tired Hands’ beers right now. Billy is the host of The Brewcast, a beer podcast that never records on a regular schedule. You can follow his drinking habit @beardbrews on Twitter.